We really like Misfit's approach tofitness wearables. They make them cheap, stylish, with a bit of attitude and run them off of a watch battery so they go six months or so between charges. 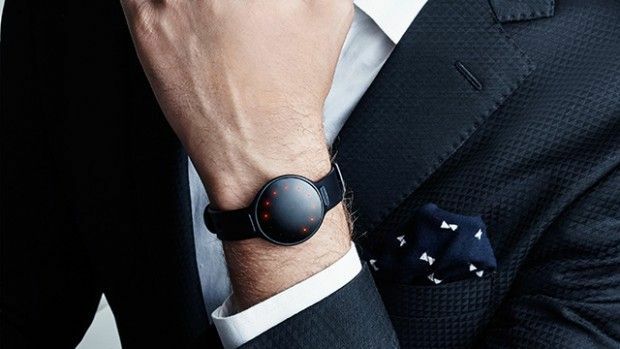 Its new one, the flagship Misfit Shine 2, is their most sophisticated device yet. A mix of stylish watch and fitness wearable, you could think of it as a cheaper Withings Activité Pop or a Jawbone UP that you can tell the time on. Slightly larger in diameter than the original Misfit Shine, but also slightly thinner (3.3mm at its edge), the Shine 2 is made of 'aircraft grade' aluminium. The headline improvements are the addition of vibration, so you can get call and text alerts, and the fact that the 12 LEDs around its edge, which serve as clock 'hands' or show progress towards your step goal, are now brighter and easier to read, as well as being able to show 6 million colours. Misfit's Link feature now works over new-fangled Bluetooth 4.1 and, as ever, adds neat little bits of functionality to the watch's display touch controller, turning it into a basic remote control foryour phone's camera and music player, compatible smart bulbs and other smart home gubbins. The three-axis accelerometer means the Shine also does all the usual step and sleep tracking things, but as the Misfit Shine 2 is waterproof to 50m, it also throws in swim tracking. The vibro alert also reminds you to move if you've been sat around for too long, as is rapidly becoming standard on these devices, while the watch's ability to tell if you're in light or deep sleep should allow it to gently vibrate you to wakefulness at the optimum time in your sleep cycle. As well as a wrist strap, the Shine 2 comes with a 'clasp and action clip' for putting on your waistband or bra strap. Or attaching to your ear - hey, why not. Also promised is, 'Enhanced touch technology, with better tap detection algorithms and capacitive sensors' that, 'makes tap/ touch detection more sensitive and accurate.' In other words, when you press it, it's more likely to respond than its sometimes uncooperative predecessor. Interstingly, we once had a Misfit Shine that we lost whilst gardening. We found it almost a year later and it was still working. True story. The Misfit Shine 2 is available in Carbon Black or Rose Gold finishes from November 1 for $100 in the US and £80 in the UK. That's a bit of a step up from the original, which will remain on sale for around £50/$50, and puts the Shine 2 in direct competition with the Jawbone UP2.